Toscanini for ‘fancy-schmancy’ Dinner in Ocho Rios! Suga visited Toscanini in Tower Isle, St. Mary last week Saturday as part of her 30th Birthday festivities. Toscanini may not be obvious to find on the road at night, however it is at Harmony Hall. 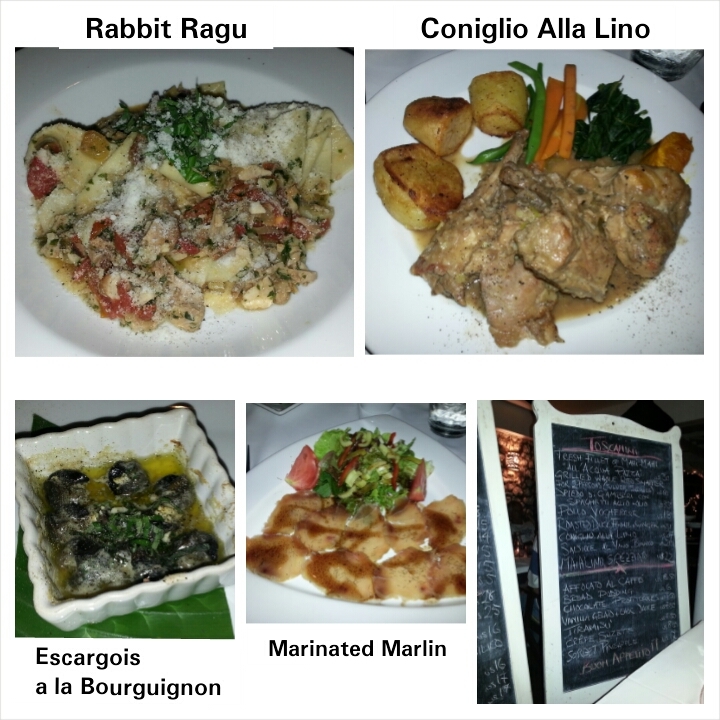 Toscanini is THE best, authentic Italian restaurant on the island. It has had famous visitors such as the Rolling Stones, Past American President Bill Clinton and more. The staff is pleasant and the service is excellent and on point. How so? The wait staff is quite knowledgeable of the menu that is written in mostly Italian and are aware of possible substitutions that can be made based on what may or may not be available in the kitchen. They have the ability to make suitable suggestions and remain calm and courteous while doing so. They are quite attentive as well. A glass of water never goes empty. Suga and her beau started with a tasty Marinated Marlin and flaming, hot Escargois a la Bourguignon. The Marinated Marlin was accompanied by a fresh garden salad. Toscanini sources most of their greens from their very own garden, get fresh fish from the fishermen on the beach across the road and fresh meats from the local butcher. Rabbit Ragu and Coniglio Alla Lino (Rabbit with steamed vegetables and roasted potatoes) followed for the main course, which were delicious and so filling, they left no room for dessert. However, this was not Suga’s first visit so, the Chocolate Profiteroles is fully endorsed for dessert. Owner and Chef, Pierluigi Ricci came out and greeted all guests and asked how we found the food. No complaints here, that’s for sure. There is also a well stocked bar to order drinks from. Prices range from affordable to expensive, depending on whether you are ordering Chicken or Duck of course. Everything on the menu is good though and worth every dollar. Ambience is great, whether day or night with picturesque gardens and the sea nearby. Parking is adequate and if you want to ‘shampoo’ and hit the streets or go for a road trip for lunch or dinner, Toscanini is the place. However, always call before and make reservations or let them know you are on your way. Previous PostRotaract Club of Kingston Painted All Classrooms at Four Square Basic SchoolNext PostBread Pudding from Monte Carlo Terra Nova ‘tun up’ !